I spend so much time waiting for Spring asparagus every year that I love doing many things with it for the peak weeks. Sometimes, it's simply steamed and wrapped with Prosciutto or Jamón Ibérico (thank you, Gam, it's stunning!!) and covered with a two-minute poached egg. 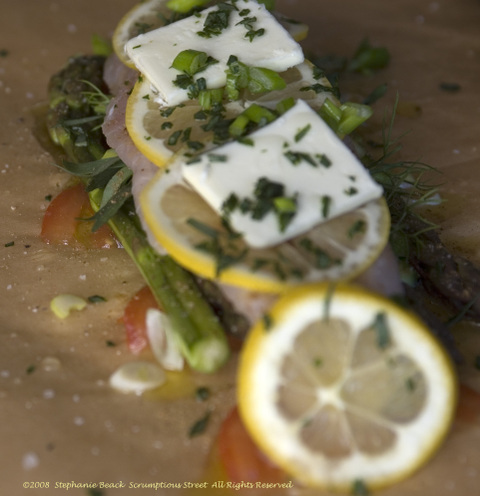 Other times, they become the very important supporting ingredient in a wonderful main course like this "Red Snapper and Asparagus en Papillote" that I created recently. I don't know which is more succulent; the fish or the asparagus. But, they were both delicious. If you haven't tried cooking fish in parchment paper before, it is honestly very simple and one of the tastiest, juiciest results for your fish. You use at least some kind of acid, some kind of oil, some aromatics and some seasoning to get great flavor into the fish. 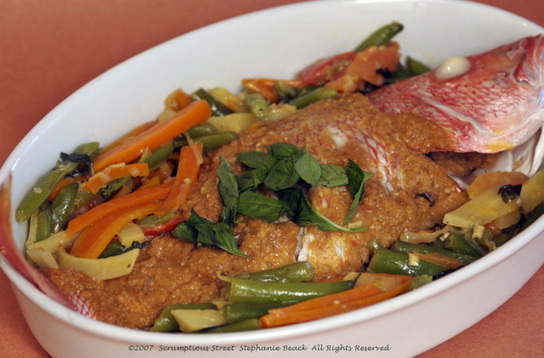 I also put various kinds of tender and flavorful vegetables with the fish. 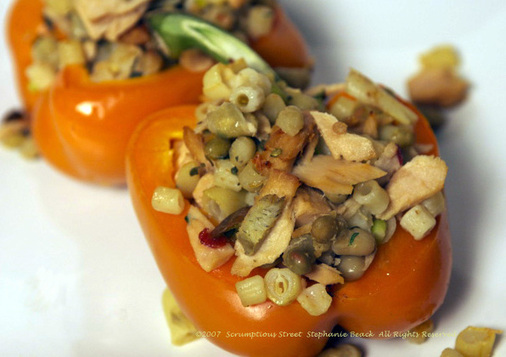 Then you toss liquids, aromatics and veggies together and put the vegetables down first and the fish on top. Drizzle with more liquids, season and a couple thin pats of butter. Wrap it up like a package and then bake it. The technique is steaming the food inside the paper and it comes out perfectly cooked, moist and full of whatever lovely flavors are inside the package. If you like doing fish at home, this is a must-try technique! 1. Preheat oven to 325˚F. Season the fish with salt, pepper and Chinese 5-Spice powder on all sides. 2. In a bowl, toss together the asparagus, tomato, chives, 2 T. olive oil, a pinch of salt and pepper and juice from half a lemon. 3. Tear off two large pieces of parchment paper and fold in half, creasing well. Make sure one fillet will fit completely inside the paper when folded. Brush the paper with 1 T. olive oil per paper. Spoon the asparagus and tomatoes onto the middle of one side of the paper. Next, place the fennel fronds and tarragon stems on top of the vegetables. Lay one fish fillet on top of each pile of vegetables, lengthwise so that the fish is parallel to the crease in your paper. Sprinkle minced tarragon on top of the fish, place the lemon and butter slices on top of that and sprinkle both fillets with the white wine, 1 T. per fillet. 4. Fold the top half of the paper over your pile of vegetables and fish and begin rolling and crimping the paper so that it will hold together and make a nice half-moon or heart-shaped package. I've got a photo of that from a previous post. 5. Place the packages on a large rimmed baking sheet and bake for 10-12 minutes, depending on your oven and thickness of fillets. Remove the packages from the oven and slit them with a knife to let the steam escape. Serve immediately from the package or remove and plate. 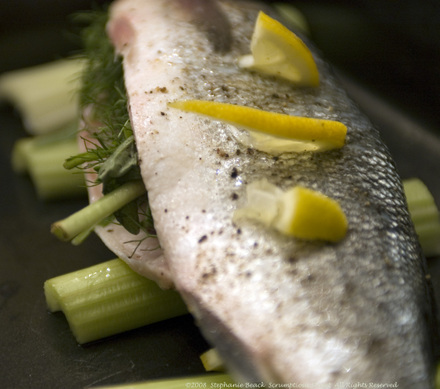 One note: remove the fennel and tarragon stems before eating. They're only there for flavor and are too tough to eat. 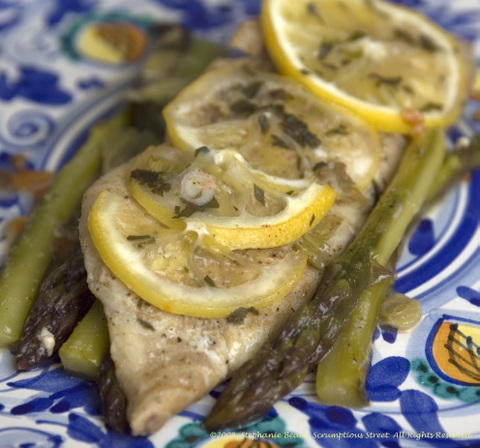 Have fun and enjoy the flavors of Spring at their most tender and moist! For the first time in my adult life, a real gas grill is sitting outside on my first-ever backyard deck. Since it was +85˚F in the Bay Area this weekend, Mr. Scrumptious and I decided to commit to making the ultimate Summer cooking purchase. Up to this point I've been using my terrific grill pan with no complaints. While the "real grill" is large and somewhat intimidating to my urban conditioning, I must say I'm thrilled about the variety and quality of tastes we can now produce. Mr. Scrumptious is the Master Grill Chef, and I'm the Sous-Chef, Saucier and Line Cook. I don't mind a bit. This weekend we did these delectable "Grilled Swordfish on Rosemary Skewers" and they blew my mind and thrilled my tastebuds! 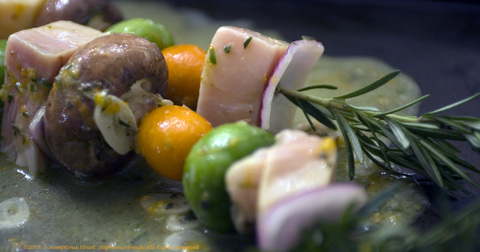 My marinade was really delicious and the combination of these specific vegetables with the rosemary, citrus and fish was a true winner. If you haven't used kumquats before hear this: they are pure gold. Their flavor is so sweet, bright and fresh and when grilled they nearly turn to marmalade inside their skins. You eat the whole fruit, skins and all, and they're a perfect match for swordfish. Also, make sure to use white pepper; it's better than black for fish. If you like grilling, explosions of flavor, and the hefty satisfaction of smoky swordfish, try this out! 1. Make the marinade by combining all its ingredients into a bowl and whisking together. Cut the swordfish into chunks and place into a air-tight plastic bag. Pour in the marinade, zip the bag closed and turn and shake several seconds to coat all the fish. Place the bag into the refrigerator and let marinate 4-6 hours. 2. Take the rosemary skewers and wash thoroughly. Strip the leaves off the bottom 3/4 of the branch, leaving just a tuft at the top. Save the rosemary leaves. Place the rosemary branches in a deep, large pan and cover with water. Let the branches sit for several hours in the water so they don't burst into flames on the grill. 3. 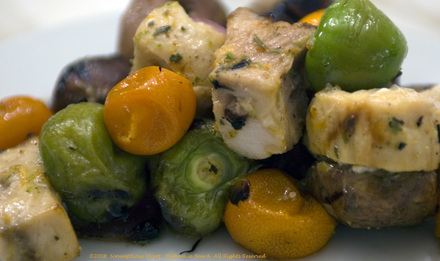 Clean and prepare the kumquats, tomatillos, mushrooms and onions. Keep everything whole except the onions. 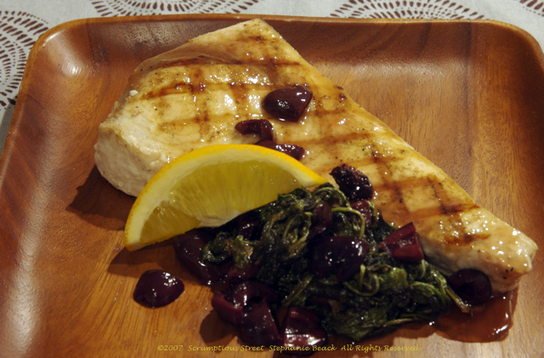 About an hour before you're ready to grill, add the fruit and vegetables to the bag with the swordfish. Shake the bag to mix together and get the marinade running over everything. Let stand at room temperature at least 30-45 minutes. 4. Get the grill preheating to between 475˚ and 500˚F. While that's working, thread the fish, fruit and vegetables onto the skewers. I found it easiest to cut the bottom of the branch into a sharp point so I didn't tear my food getting it onto the skewer. Place the skewers on a baking sheet and drizzle the marinade over everything. 5. Grill the skewers about 2-3 minutes per side, depending on your grill. Baste each side evenly with the marinade. Turn the skewers 3 times for a total of 6-9 minutes cooking time. Make sure the swordfish is opaque and slightly firm but not hard and that the veggies and fruit are delightfully tender and charred. 6. Remove the skewers from the grill and slide off the branch onto a plate using a large fork. Enjoy with a cold beer and some banana-mustard potato salad. Dessert was simple but spectacular: sliced fresh strawberries drizzled with Meyer Memon juice, balsamic vinegar, a dusting of sugar and black pepper (yes, that's right, black pepper! It's amazing with balsamic vinegar if you haven't tried the combination) and Meyer Lemon zest. This was our wonderful and quite possibly, perfect, first weekend of summer meal! As for the grill, it's awesome. With porcelain grates, a side sauce flame, temperatures up to 700˚F and settings for sear, grill, barbecque and ability to add wood chips for smokiness, it's going to make my summer cooking and recipes that much more fun! If you've been reading for a while, you know that the last few months I've done a few posts on cooking with alcohol and also that Mr. Scrumptious was recently in Mexico. As a gift from his company, he brought home an incredible Mexican liqueur called Xtabentun Kukulkan. Made from honey, cactus and tree bark it's is deliciously sweet, velvety and lightly licorice or anise flavored. It used in things like Mayan coffee and flambé desserts. Wow, has it got legs, like a spectacular and heavy wine. I thought the licorice and honey tones would go very nicely with a variety of tart and peppery flavors. Wow, did it ever. I came up with a "Grilled Swordfish Kukulkan." It was phenomenal. You could of course skip the liqueur, or use something like ouzo for a similar result. Or maybe a little bit of honey and ouzo. It's up to your pantry and creativity, but these ideas will get you started on the path of something terrific. 1. Heat a grill pan or outdoor grill until smoking hot. Season the swordfish by rubbing with the Chinese 5-spice powder. Grill until done, about 7-10 minutes per side, depending on thickness of steaks. 2. Heat a medium skillet on medium-high and add the olive oil. When shimmering, squeeze in the lemon juice, add the garlic, olives and liqueur. Stir to incorporate. Add the arugula and cook until greens are just wilted, about 4-5 minutes. 3. Remove the veggies from the pan and discard the garlic. 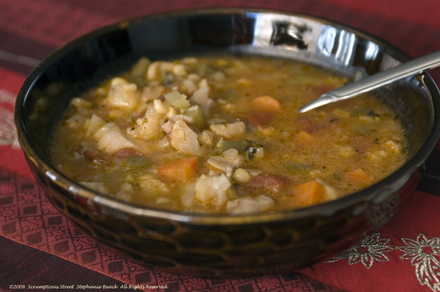 Leave the juices and sauce behind and continue to simmer, reducing the sauce. 4. When swordfish is done, remove and plate. Place the veggies along the sides of the fish. Add the butter to the skillet still on the stove and swirl to melt. 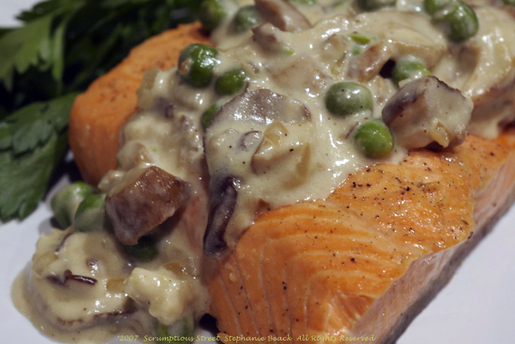 When completely thick and melted, spoon the sauce over the fish and veggies. Serve immediately. This appetizer works as a light but interesting prelude to any meal you're serving this summer. I combined a fresh and delicate fish with a smoky flavored fish, some light herbs and spices, with a little tang and zip. We devoured my "Lemon Sole and Smoked Salmon Bruschetta". 1. Heat a grill pan until smoking hot. Season the fresh fish fillet with olive oil, kosher salt and white pepper. Grill the fish until completely cooked through, about 3-4 minutes each side. Remove from heat and let cool completely. 2. 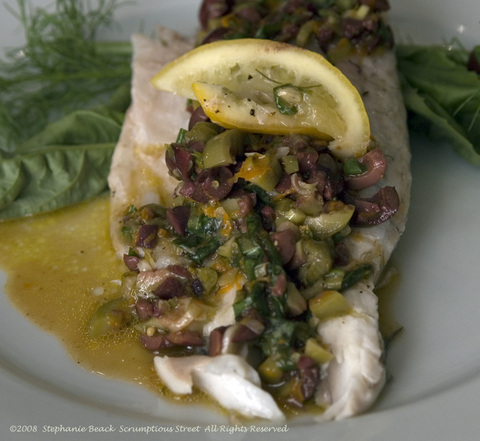 In a medium bowl, add the cooled lemon sole and smoked salmon. Flake with a fork until the fish is in small chunks and flakes. Add the herbs, capers, onion and a pinch of kosher salt and a few grinds of white pepper. Toss gently with the fork and taste. 3. Add the crème fraîche, tabasco, olive oil and lemon juice and combine thoroughly. Taste again. Add more salt and pepper if desired. Cover the bowl with plastic wrap and refrigerate until 15 minutes before serving. Best if left 1-3 hours in fridge. 4. Preheat the oven to 350˚F and toast the baguette slices in the oven until golden brown, about 8-10 minutes each side. While the bread is toasting, remove the fish mixture from refrigerator to bring up to room temperature. 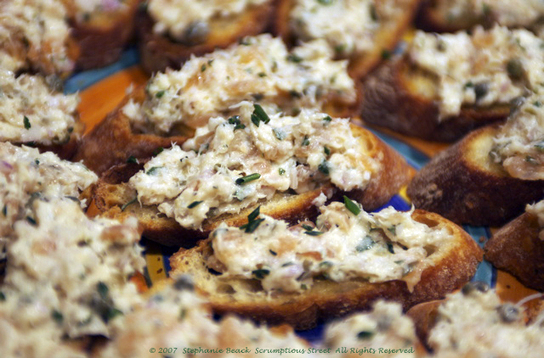 When the baguettes are toasted, top each slice with a spoonful of the fish mixture and garnish with extra chives. Lay out on a beautiful serving platter and enjoy! I definitely like using white pepper in this dish instead of black pepper, I really enjoy its subtle flavor so much with fish. Also, the lemon juice works extremely well with the lemon-tinged herbs so whatever you choose pick an herb with an oniony flavor and one with a more citrus or tangy flavor. This was a great hit! Food must always be delicious, but sometimes it's really fun to make it not only delicious, but colorful and vibrant. As we edge ever closer to full-on Spring, my meals are perking up in color and foreshadowing what we'll soon be seeing on streets, in gardens and apartment railing planters. (Yes, I am attempting to grow flowers for the first time EVER this year!) So, this is a plate full of delicious color, if that's possible. 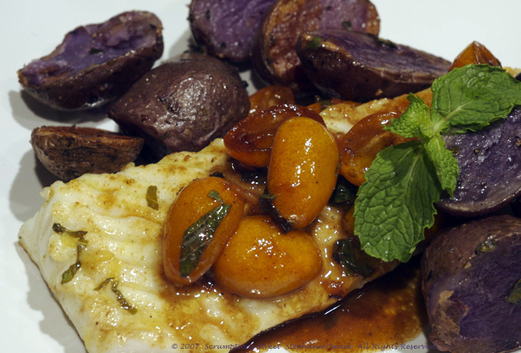 Here are two quick recipes, "Pan-Seared Halibut with Kumquats and Mint" and "Roasted Purple Fingerling Potatoes." In creating this meal, I really felt like I was painting a blank canvas of halibut with rich hues as well as intense flavors. It all started with the kumquats, which were so plump and inviting I couldn't resist them. Knowing they would still be quite tart, the mint seemed a perfect way to balance them since mint sweetens and lifts the tartness right out of the citrus. 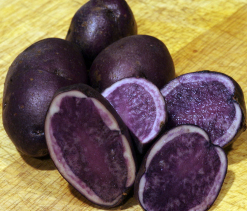 The purple fingerling potatoes taste exactly like regular potatoes but their color is such a deep and luxurious hue that I loved the way it would all look together. Both recipes are extremely quick and simple but one word of caution: Do not EAT the entire kumquat unless you really truly adore very tart and bitter things. We did not eat them, I used them for their flavor in making the delicious sauce for the fish and kept them in the photo for the visual effect on the plate. But, again, most of you will not want to eat them. Unless you eat raw lemons, rind and all. Then, go for it! Here are my recipes for each. 1. Preheat oven to 375˚F while you scrub and cut the potatoes and mince the herbs. 2. Spread the potatoes in a single layer on a rimmed jelly roll baking pan and sprinkle with the olive oil, salt, pepper and herbs. 3. Roast for a total of 25 minutes in the center rack of the oven. 1. Season the halibut fillets with a little extra virgin olive oil and sprinkle the Chinese Five-Spice powder on both sides of the fillets, using enough to have a light even dusting on each piece. 2. Put a large skillet or flat saute pan on medium-high heat and add the olive oil. Heat the oil and toss in the kumquats and ginger. Saute about 5 minutes, until the kumquats begin to caramelize and turn a deep golden brown. 3. Add 2 T. white wine and stir to incorporate. Move the kumquats and sauce to the edge of the pan and clear enough space in the center of your pan for the halibut fillets. 4. Place the halibut in the pan and sear the former skin side first, until the flesh is opaque, about 2-3 minutes depending on thickness. Flip the fillets and sear the other side as well, about another 2-3 minutes. Make sure to only cook the fish until the tines of a fork easily separate the flesh. 5. Remove the fillets from the pan and put on each plate. The potatoes should also be done at this point, remove them from the oven and let cool slightly. 6. Add the other 2 T. wine to the saute pan from the fish and lower the flame to low. You should be de-glazing the pan but not have very much liquid at this point. Add the butter and mint to the sauce and swirl the pan to melt. 7. Take the sauce off the heat and spoon over the fish. Add the potatoes on the side and serve immediately. DON'T EAT THE KUMQUATS. Unless you really want to. You could always remove them from the sauce before serving but that totally changes the beauty of the dish. I just would warn fellow diners and let them make their choice.